Dhaka, 30 Mar, Abnews: Prime Minister Sheikh Hasina yesterday urged the countrymen to cast vote for Awami League in upcoming elections recalling the party's historic role and sacrifices in realizing Bengali rights, nation building, independence and for continuity of the current development spree. "Cast your vote for our 'boat', we will give you a Sonar Bangla," she said while addressing a huge public meeting at Thakurgaon Govt. High School Ground here yesterday. Sheikh Hasina decades ago the Bengalis earned its language rights as the people voted for the party, which in subsequent years spearheaded the nation building campaign and eventually the "boat led us towards the independence" in 1971. "Bangladesh is now on the road of development as people gave their vote for 'boat' in 2009 and 2014," she told the rally organized by the district unit of Awami League (AL). The premier said continuation of the incumbent government was very crucial for continued development works, Sheikh Hasina said. "Actually, boat gave everything to mankind . . . the 'kisti' (boat) of Prophet Nuh (A) saved the mankind and animal kingdom," she said. AL general secretary Obaidul Quader, foreign minister AH Mahmood Ali, presidium member Ramesh Chandra Sen, advisory council member Satish C. Roy, joint general secretaries Mahbubul Alam Hanif and Jahangir Kabir Nanak, central leaders Khaled Mahmud Chowdhury, BM Mozammel Haque and Nurul Islam Sujan addressed the meeting, among others. The party's Thakurgaon district unit president Dabirul Islam, MP chaired the meeting, conducted by general secretary Adul Mazid Apel. Sheikh Hasina said once Bangladesh was exposed to extreme poverty while her party took various programmes for poverty alleviation and to bring the vulnerable people under 142 types of safety net programmes. She said some 67 lakh elderly people and widows now get allowance. Sheikh Hasina promised to improve Thakurgaon's road, air and railway communications and take particular steps to introduce an intercity train service to link it with the capital. The premier reminded the residents of the northwestern district that the past BNP government shutdown the Syedpur and Rajshahi airports in the region while her government reestablished the facilities after elected to power in 2009. "BNP destroyed not only the Biman (airlines), they destroyed the whole country . . . they don't know how to create, they know how to destroy (and again) BNP doesn't know how to give something to people, but know how to plunder public property," she added. On the other hand, she said, the country witnessed a massive development of multimodal communication infrastructures as Awami League was elected to power in 1996 and 2009 when her government also resolved the acute power crisis. The premier said only in three and half years after the independence Father of the Nation Bangabandhu Sheikh Mujibur Rahman turned Bangladesh into a least developed country but was killed while spearheading the campaign to bring smiles on the face of millions. The killers of Bangabandhu usurped power in collaboration with the anti- liberation force, thwarting country's peace and progress, she said. Sheikh Hasina thanked the voters of Thakurgaon for giving vote in favour of Awami League candidates in 2008 and 2014 elections. She recalled that that BNP tried to upset the polls in 2014 attacking polling centers in Thakurgaon when an honest presiding officer Zobaidur Rahman was killed. "As many as 3,036 innocent people were injured in the arson attack of BNP in 2013, 2014 and 2015 across the country and out of them about 500 died . . . 500 vehicles including railway wagons were set on fire," the premier said. 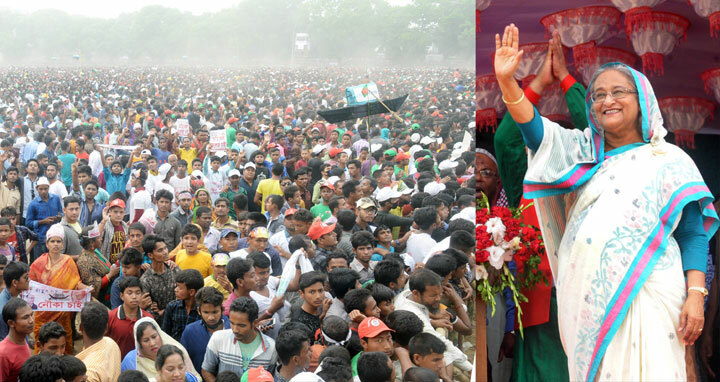 "But people of Thakurgaon cast their votes for Awami League defying all obstructions," she said. Pointing out the repeated attacks of BNP on railway properties the Prime Minister said BNP wanted to wipe out railway network from the country. As part of their plan, she said, BNP closed down many rail lines in different parts of the country. Sheikh Hasina said the Awami League government has taken initiative to reopen the rail lines. Duel gauge rail tracks are being constructed from Parbotipur to Banglabandh, she added. Highlighting the steps taken by her government for the welfare of farmers and agricultural development in the country, the Prime Minister said BNP killed 18 farmers for demanding fertilizer. "We have taken measures to reach fertilizer to the doorstep of farmers at fair prices," she said. The Prime Minister said all northern districts of the country have witnessed massive development during the Awami League tenure. Many of those development projects were undertaken before people even raised demand for it, she said. "I've visited all over the country up to rural level. So, I know better about your necessities," Sheikh Hasina said adding ensuring power for all is not a matter of luxury but a responsibility to her. Recalling the attacks of BNP and Jamaat activists on a fire station in Kansat in 2014 and elsewhere the Prime Minister said they also killed the engineer of a sub-station by throwing him into fire. In the name of politics, BNP is actually pursuing a politics of destruction, she noted. Sheikh Hasina said BNP chairperson and her son have plundered more than Taka 980 crore from banks. They have no shortage of wealth, but they didn't give back any money till now. "Even, Begum Zia didn't spend a single Taka for the orphans which she received from overseas donors," she said. The Prime Minister said Khaleda Zia embezzled the whole amount, for which she was found guilty by the court. But, now they want to wage movement against the court verdict, she lamented. Sheikh Hasina said her utmost duty is to work for the peoples' welfare and bring smile in the faces of the people through changing their lots. The Prime Minister said a political party having no faith in country's independence can never take the country towards prosperity.